Located in the bottom left hand corner of the property, this is 1 of 3 show rings that contain an all-weather footing. 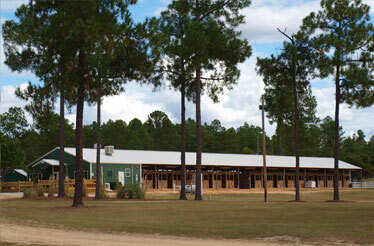 All of our footing on the property is designed by leading arena specialist Bob Kiser. Bob has worked on projects all across the US and most notably the 2010 World Equestrian Games. The footing is designed so an event can resume within minutes of a torrential downpour. All rings contain a high pressure irrigation system that waters the rings quickly and minimizes downtime during an event. This is a 240' x 135' rectangular ring with 45° corners. 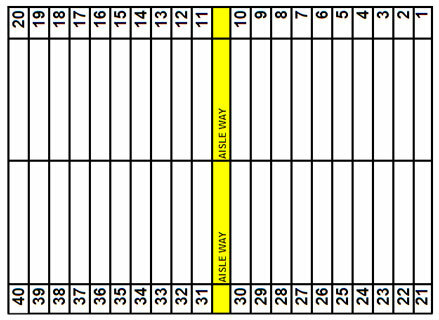 Ring gates are located on each end of the ring. A 10' x 12' judge's stand also overlooks this ring. Each of the three outdoor rings has a large judge's stand with powered outlets. The Bonham Oval and Ring 2 stands are 12' x 16' and the Ring 3 stand is 10' x 12'. These stands were designed with overhangs to help keep driving rainwater out and large enough to hold judges, announcers, and other necessary staff. 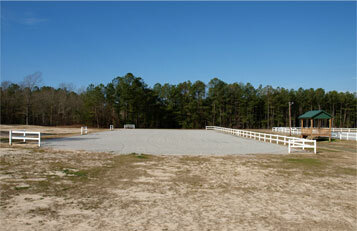 Schooling Area 2 is located just below Barn Z and in front of Ring 3. This ring is outfitted with sections of fencing to give this ring its shape. 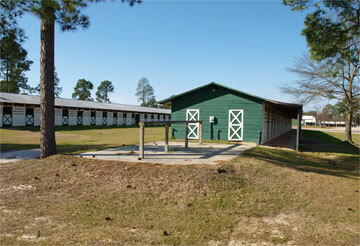 Like other warm up and show rings, this is also irrigated and properly built with outdoor, all-weather footing. 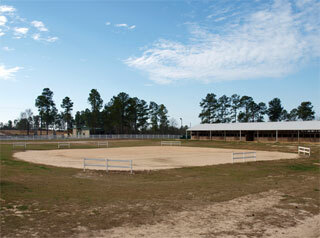 This ring measures 205' x 88' and is a little quieter and less active than other schooling rings. Located in the middle, lower section of the property, this is 1 of 3 show rings that contain an all-weather footing. 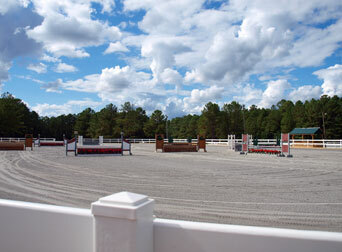 All of our footing on the property is designed by leading arena specialist Bob Kiser. Bob has worked on projects all across the US and most notably the 2010 World Equestrian Games. This footing is designed so an event can resume within minutes of a torrential downpour. All rings contain a high pressure irrigation system that waters the rings quickly and minimizes downtime during an event. This is a 276' x 144' rectangular ring with 45° corners. Ring gates are located on each end of the ring. A 12' x 16' judge's stand also overlooks this ring. 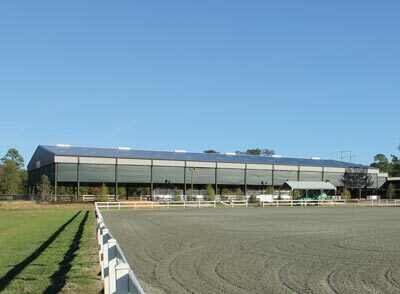 This covered pavilion was installed between Ring 2 and the busiest schooling ring to offer a place that horse, rider, and spectator can get out of the weather. 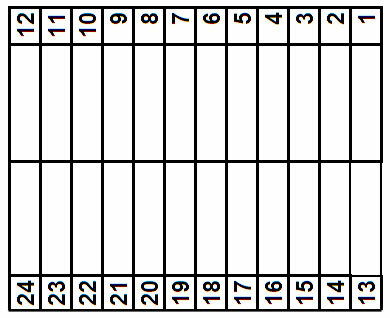 It can be used for a variety of things depending on the event and show management. 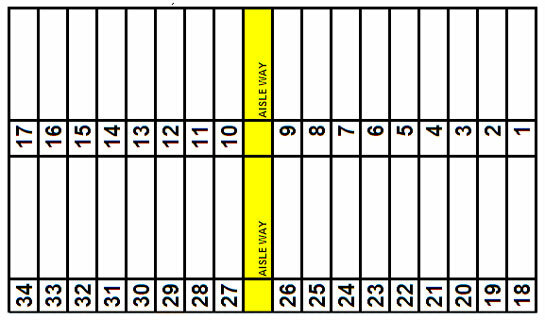 Schooling Area 2 is located just above Ring 2. This ring is outfitted with sections of fencing to give this ring its shape. 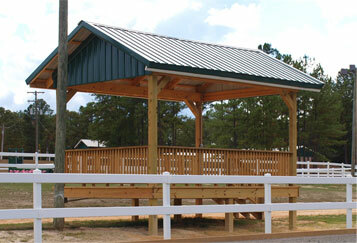 Like other warm up and show rings, this is also irrigated and properly built with outdoor, all-weather footing. This ring measures ?' x ?'. 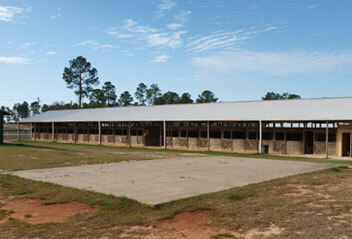 The South Carolina Equine park is home to a brand new covered arena. 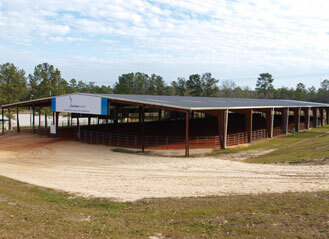 The overall size of the arena measures 150' wide by 280' long with a show floor of 135' by 265'. It's floor is made of a sand and clay mix and has been received well by all disciplines. The arena features a 30ft eve height for great ventilation and is surrounded by wind and rain screening. 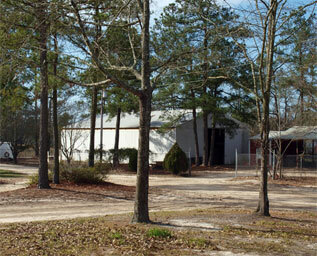 The Kershaw Health Covered Arena is located on the east end of the property to the right of the Bonham Oval. 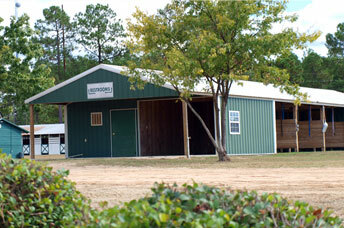 This arena is used for schooling, lunging, show classes, rodeos and a large number of other events. The ring measures 247' x 116' with the building extending further. There is also a show office and an independent sound system from the rest of the park. 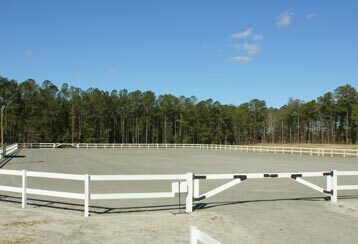 The footing is a specially designed clay & sand mixture designed by leading arena specialist Bob Kiser. Bob has worked on projects all across the US and most notably the 2010 World Equestrian Games. The building has three massive 18' fans that keep the air moving when needed and makes the arena a nice place to show when the other rings are not available or the weather is poor. 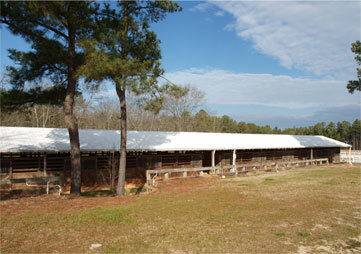 The west end of the building is a covered area that contains stall pens for cattle and measures 139' x 57' with the building extending further around the pens. There are cattle shoots on each end of the cattle area to help with loading and unloading. The area has fans, lighting, water, and electrical outlets. Phase 2: Add permanent amenities (restrooms, concessions, event office, etc. Phase 3: Enclosed arena including overhead doors for natural ventilation. Named after the late Max & Nancy Bonham this ring is situated in the middle of the property just behind the show office and above Ring 2. This ring is outfitted with lights so showing can continue after dark. This oval ring is also located below the popular "hill" which spectators use to view classes in the oval. This is 1 of 3 show rings that contain an all-weather footing. 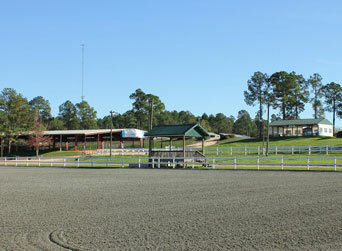 All of our footing on the property designed by leading arena specialist Bob Kiser. Bob has worked on projects all across the US and most notably the 2010 World Equestrian Games. This footing is designed so an event can resume within minutes of a torrential downpour. All rings contain a high pressure irrigation system that waters the rings quickly and minimizes downtime during an event. This is a 300' x 146' oval ring. Ring gates are located on each end. A 12' x 16' judge's stand overlooks this ring. The Show Office, which is centrally located in the park, is where most of management and announcing is done. Every event is different and the office serves many roles depending on that particular event. It also includes two public restrooms on the west side of the building that contain multiple sinks, toilets/urinals, & showers. These areas are heated and cooled and a bit roomier than portable bath houses. The show office and its surrounding area also contains WIFI that is available free of charge. Overlooking the Bonham Oval (Ring 1) this covered area is located next to the Show Office in the middle of the park. 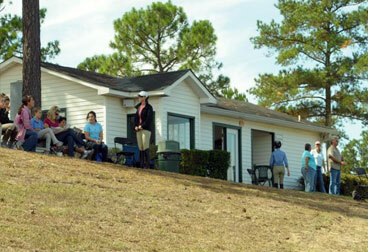 This pavilion can be used for a variety of things such as catered meals, seating to watch show classes, or to get out of the Southern weather! This 30' x 50' structure contains lighting, fans, electrical outlets, and seating, along with access to free WIFI. With this addition to the park, we are able to offer a great place to host events so shows do not have to spend extra money for tents. 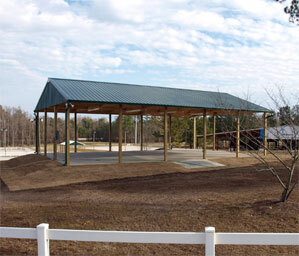 Offerings like this covered pavilion help a shows bottom line and make hosting a show at the South Carolina Equine Park more desirable and profitable for both management and exhibitors. 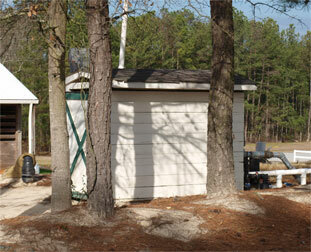 Located next to the pump house and in front of Barn Z this wash stall serves the bottom west end of the property. 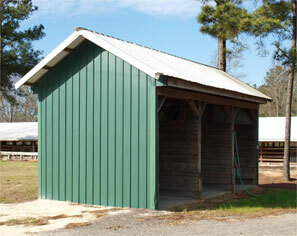 All barns have a wash stall either attached to the barn or in close proximity. 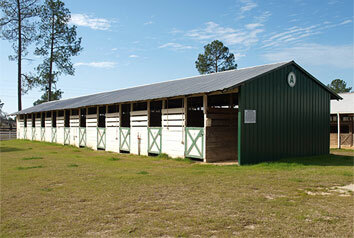 The South Carolina Equine Park has 9 barns with a total of 288 stalls. 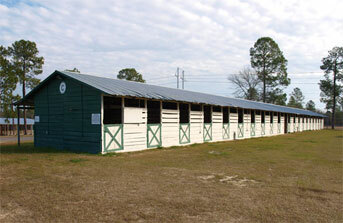 Every stall has rubber matting, and all barns contain lighting, water and electrical outlets. 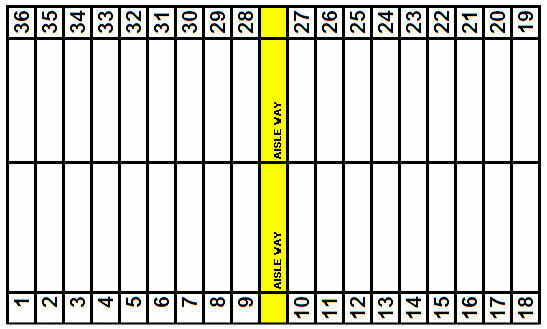 Stalls in barns A, B, C, D, & E (east end of property) are 10' x 10' and stalls in barns W, X, Y, & Z (west end of property) are 10' x 12'. 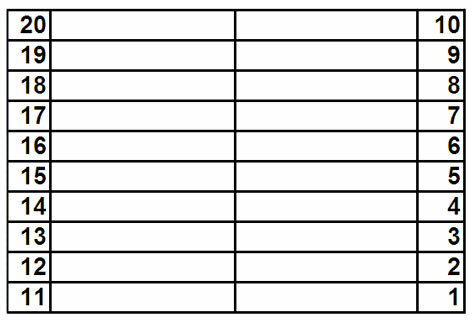 Please click the link below to view the stall chart for this barn. 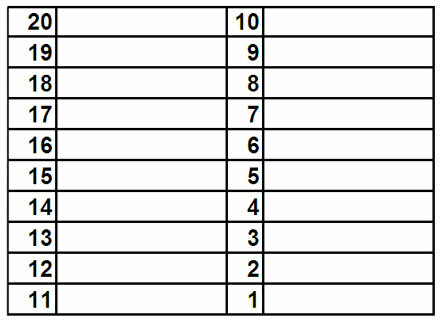 If available, you can click the numbers on the pictures to view additional photos. This section of the complex holds the equipment and personnel that make the rings and park function properly. One of the most important aspects of maintaining the grounds and rings is having the proper equipment and the people to know how to use it. This is a busy section of the park and is located in the front left hand corner near the main entrance for cars and trucks. It's tucked away so that it doesn't interfere with barns, pedestrians, cars, or horses. Due to the amount of machinery and traffic moving about, this area is off limits to anyone other than park staff and approved individuals. If any maintenance issues or problems arise, please notify the show staff and they will relay it to our maintenance employees. This is a busy section of the park and is located in the front left hand corner near the main entrance for cars and trucks. It�s tucked away so that it doesn't interfere with barns, pedestrians, cars, or horses. Due to the amount of machinery and traffic moving about, this area is off limits to anyone other than park staff and approved individuals. If any maintenance issues or problems arise, please notify the show staff and they will relay it to our maintenance employees. 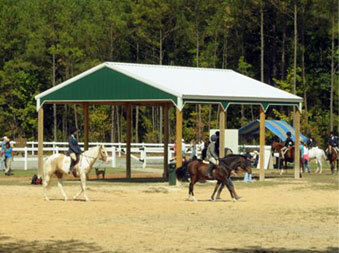 This warm up area is located in the middle of the property between the Fatz Cafe (Barn W) and Barn Y. This warm up is more of a sandy type of footing and often used for lunging. 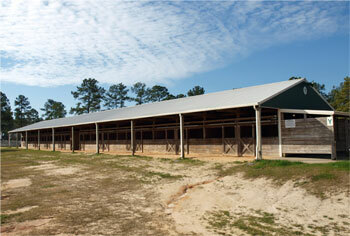 With its central location, it is closer to more barns than the other schooling rings. Unlike the other schooling areas and rings, this warm up is watered by a water truck and not by irrigation. This ring serves as a multipurpose ring and is used for many different ways. 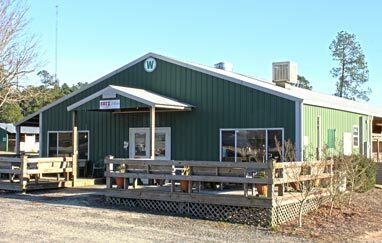 The South Carolina Equine Park welcomes back Fatz Cafe for its second year as the park's official food vendor. 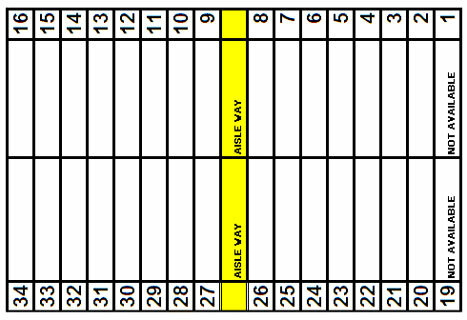 This pad has a variety of uses and is most often used by vendors. 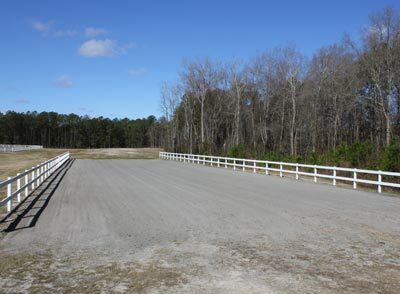 Typically, a vendor will set up here to utilize the location for its concrete pad. This building serves three main purposes. 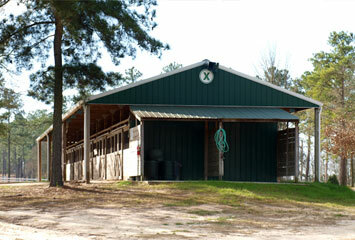 The front is often used by employees and Farrier's as a covered garage type area. 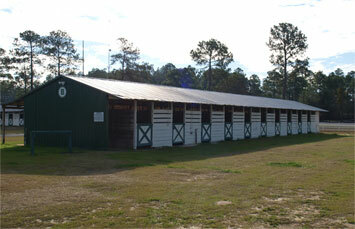 The center contains wash stalls and the rear of the building has Men's and Women's restrooms. This bath house serves the east end of the property and they are the largest and nicest bathrooms on the grounds. Located on the rear of barns C, D, & E the grooming areas contain a hitching post to tie your horse to groom or bathe them close to the stall. 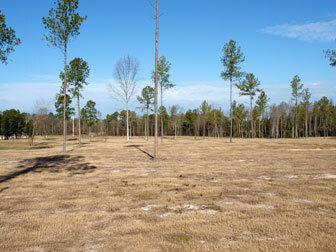 These areas are used less frequently than many of the other wash stations around the park and can be much quieter. 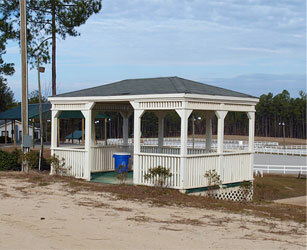 There are multiple gazebo�s located around the property. They are primarily used for visitors and exhibitors to rest their legs, eat a bite, or get out of the weather. Vendors are usually prohibited from setting up in these areas. 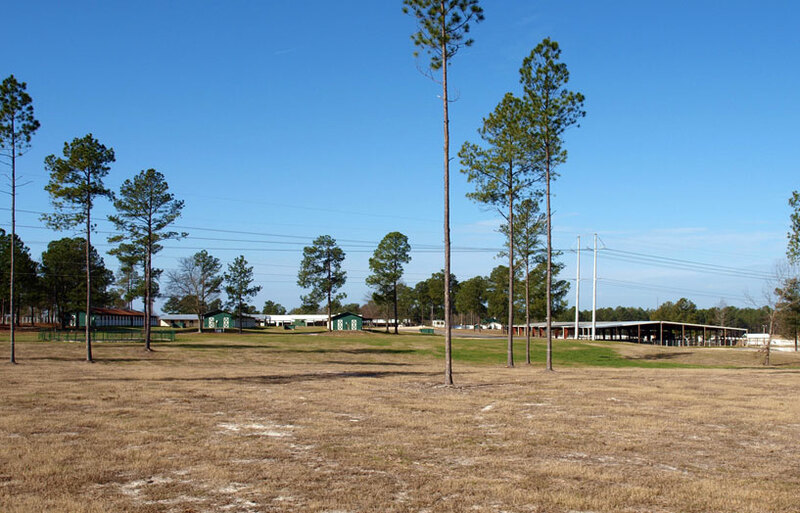 Look for these structures on the property and enjoy!